Rhode Island Personal Injury Lawyer, Accident Attorney | Law Offices of Ronald J. Resmini, LTD.
We wrote the book on personal injury and civil procedure here in Rhode Island. Other attorneys refer their cases to us. Ronald Resmini has more than three decades of experience representing clients in hundreds of accident and personal injury cases. We are a family law firm, we are trial lawyers, who aggressively represent with utmost integrity to our clients. We advance all costs of preparing the case, and you pay nothing until we win your case. Ronald J. Resmini has been one of Rhode Island's foremost trial and appellate attorneys for the past 50 years. 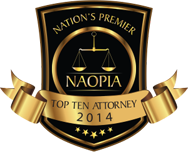 An invitation-only organization composed of the top premier trial lawyers in each state. A list of local lawyers who have reached professional excellence and the highest ethical standard levels, according to Martindale-Hubbell®. An organization composed of top trial lawyers from each state who are younger than age 40. While up to 5% of lawyers in the state are admitted to Super Lawyers, no more than 2.5 percent of lawyers are named Rising Stars. Super Lawyers Attorneys included in Super Lawyers® are among the top 5% of lawyers in their region and area of practice. AV Preeminent® is a significant rating accomplishment, stating that the lawyer's peers rank the firm at the absolute highest level of professional excellence. A prestigious group of trial lawyers throughout the United States whose membership is limited to attorneys who have won million and multi-million dollar verdicts and settlements. There are over 1.2 million attorneys in the U.S. and less than 1% are selected to recover the AATA premier 100 designation. 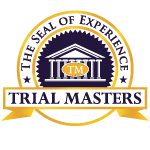 Membership in Trial Masters™ is a significant achievement and an indication of their strong commitment to taking their clients’ cases all the way to the courthouse when warranted. Featured in this photograph is Partner and Founder, Ronald J. Resmini, Esq., who was awarded the prestigious honor of Massachusetts Senior Attorney of the Year for the year 2010 when Massachusetts Lawyers Weekly and the Massachusetts Bar Association celebrated Excellence in the Law in May, 2010. This is a testament to Mr. Resmini's hard-work, dedication, and determination seeking justice for his clients and improving the legal profession, not only for his clients, but all attorneys and lawyers alike. I have worked with many attorney's during my life. After falling and breaking my leg, I did not know who to call. I saw so many tv commercials with highly dramatized actors playing the role of a client. I saw a Resmini commercial. It featured Attorney Resmini along with his three sons. I felt a sense of honesty so I decided to call with my problem. They immediately took me in to their office for a consultation. After 2 days Mr Resmini's son **** called me and said they would take my case. Ever since, Ron and his staff have been by my side during interrogatories, depositions, and a lot of paper work. I have text him on a few occasions and received a return text within a minute or two. I would give them 10 stars if allowed. They have true caring and compassion for those in need. The Resmini family and its staff are the ultimate in every aspect you can imagine. Personal, professional, compassionate,caring,friendly, sincere and honest. My deepest gratitude goes out to them. The Lawyers and Staff here are top notch. Very professional and actually care about your well being. I would highly recommend their services to all of my family and friends. Producing more than 20 legal handbooks, Mr. Ronald Resmini was requested by Butterworth Publishing Company to Author a two-volume treatise entitled, Tort Law and Personal Injury Practice, which is part of the RI Practice Series (Butterworth 1990, with Annual Supplements). Later, Mr. Resmini published a two-volume series entitled, RI Actions and Remedies; a two-volume work on Civil Procedure after the major revision of the Superior Court Rules of Civil Procedure, entitled RI Civil Practice and Procedure (Michie Law Publishers, 1996, with Annual Supplements). Rhode Island law places time restrictions on filing a personal injury or wrongful death action, so protect your right to compensation by picking up the phone and calling us now. No one expects to be injured in an accident or to have to deal with the sudden death of a loved one. When the injury or death was not your fault but caused by another person’s wrongdoing, your sense of injustice may feel overwhelming and difficult to navigate. You are unprepared and understandably shaken, in physical or emotional pain, compounded by economic pressures. When you find yourself overwhelmed by pain and suffering, legal inquiries, and financial demands, we are here for you. It is to be expected that you have many questions about what needs to be done and what your next step should be. At this difficult time, you can turn to the Providence law firm of the Law Offices of Ronald J. Resmini, LTD. for answers to all of your questions, support, and guidance through the steps of the legal process. When your life has been torn apart and it’s not your fault, you have the right to recover money for your damages from the party whose negligence caused your losses, and we are here to help. Contact us at (401) 751-8855 to discuss your options and get the help you need. We are a family run law firm, dedicated to the pursuit of justice for the injured in our practice, which is limited exclusively to personal injury law. It’s all we do, and we do it exceptionally well. Our 50 years of experience are hard to match, and our successful representation of thousands of clients, bringing in millions of dollars in compensation awards, is well documented. Founded by Ronald J. Resmini, ESQ, our law firm is rooted in decades of excellence and unprecedented determination in the courtroom. Our founder and partners alike share a common ambition to better our communities by providing support and guidance to those who have been wronged. When you find yourself consumed by the surprise of an accident, rest assured knowing there are resources available to you that will take that heavy weight off your shoulders. Our clients are like family, and we treat each case with compassion and care so that you get the justice you deserve. With hundreds of testimonies and returning clients, we feel confident that we have the tools you need to win your case. Our experience ranges from published legal academia to flawless debate technique in the courtroom. With six practicing attorneys on our team, we have the resources necessary to take on your case and get you the compensation you deserve. Our standards are high here at the Law Offices of Ronald J. Resmini, LTD., so when you come in to talk with us, you can feel confident that you are in good hands. If this is your first experience dealing with legal matters, we understand how intimidating the initial impact can feel. The legal process is not quick and simple, but when you trust your case with our team, you will be able to rest easier knowing that you have experienced advocates fighting on your behalf to get you what you are owed. We handle all types of personal injury and wrongful death cases, including car, truck, and motorcycle accidents, bicycle and pedestrian accidents, slip and fall and other premises accidents, workplace accidents, medical malpractice, legal malpractice, insurance bad faith, and others. Each day an estimated 135,000,000 cars are on the roads in the United States, and auto accidents are the most fatal and the most common types of personal injury cases. The risk associated with driving is high, and when you fall against the odds, we know readjusting to your new reality can be staggering. Going through the process alone is daunting and frequently impossible given the complications you will find in the insurance and court systems. We are well versed in a variety of personal injury cases, so whether you have suffered a car accident or a workplace injury that is more arduous to navigate, we have the advice and competence you need to win your case. With over $5.1 million won in workplace compensation, $5 million in medical malpractice, $750,000 in drunk driving fatalities, and more, we have a reputation for relentlessly finding justice for victims of negligence. Our practice is centered on you—the client—and your needs. Whether you’re struggling to recover from a catastrophic permanent injury, an injury that is serious but from which you’ll eventually recover, or the grief that comes with the death of a beloved member of your family, we understand what you are going through. We understand that it is not about money—no amount of money can truly right the wrong that has been done; it’s about holding the negligent, reckless, or careless person who caused your grief accountable. And with that said, the money you recover can help you and your family pull through a difficult time when you are facing economic and emotional challenges and damage to your quality of life, as well as bringing closure after a sudden wrongful death. The last thing you should have to worry about when suffering is the financial impact of an accident. Let us do the hard work for you and relieve the legal pressure so you can focus on recovery and healing for yourself and your loved ones. You can trust the work we do for you. The results we have achieved after decades in this industry are incomparable. Our awards and recognition go beyond the courtroom and are proud of the outcomes we have been able to secure for our clients. We offer a completely free, no-obligation legal consult, in which we will review the available information about your case, answer all of your questions, and advise you of your legal options. Many victims often wonder how to calculate pain and suffering, types of cases that qualify as personal injury, how long the case will last, how much an insurance company should pay, and how much one can sue for the damage caused. We are in your corner and have the answers you need to move forward with obtaining justice. If you do retain our services, we will handle all the work and expenses involved in preparing your case for negotiation or litigation. You only pay if and when you win. Otherwise, you owe us nothing. That’s how confident we are in our ability to recover awards for our clients, and it makes having the best legal representation equally available to everyone, regardless of your financial situation. We have served clients in New York, Connecticut, Washington, D.C., and Florida, and with offices in both Rhode Island and Massachusetts, you have help nearby. All it takes to get started is for you to pick up the phone and give us a call or hop on our website and request a free consultation. We are here for you when you need us most, and we will not rest until you get the justice you deserve.